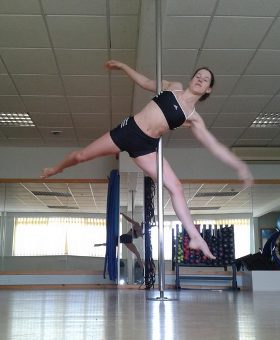 Pole Fitness gives a strong lean shape like no other form of exercise we have ever tried. That's why we love it and have brought it to our club in Wigston. We teach Pole Fitness classes in our private, air conditioned studio. We have 3 poles and classes are limited in size to ensure that all participants get plenty of time to learn the moves. We have sessions suitable for all abilities and we aim to provide a comfortable, safe environment for our participants to have fun. Nothing beats the body confidence that comes from mastering a new move! Want to give Pole Fitness a try? Our next Beginners Course starts on Saturday 4th May 2019. We offer a number of different packages to suit the size of group and occasion. Meet our Pole Fitness instructors. Here's some guidance on what to wear, and what to bring. * Gentlemen are welcome to participate in our public Pole Fitness sessions at the discretion of the class instructor.